John's Bier Blog: What’s for Breakfast? So you’re having a nice fall breakfast but you just can’t decide on the beverages. What goes with a hearty breakfast of Bacon, Scrapple, Cream Chip Beef on Toast, and Apple Fritters? Well, coffee and orange juice for sure but what a about that over breakfast beverage? Lancaster Milk Stout! Yeah that’s right, beer for breakfast! 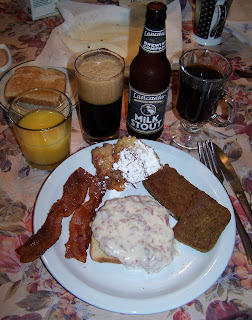 Not just any beer but a milk stout is a perfect pairing with breakfast meats like scrapple and bacon. It also lends its self well to cream chip beef on toast. Milk stout has a good amount of sugars that the yeast does not consume mainly lactose; so it is a very sweet and creamy stout. And just incase Missy may think I'm joking here is a picture of my Sunday Breakfast plate. As soon as Kathy came home from the market with scrapple I knew what I was going to have with it for breakfast; Milk Stout. Oh yes in deed, the breakfast of champions was had this morning. I’ll be posting a separate review on the Lancaster Milk Stout. I laughed so hard. I was thinking what all that for breakfast. Quick question. were you able to pick all the pig hair our before you ate your scrapple? I will have to look into this "Milk stout". Oh by the by I just wanted you to know that I am still available for counseling. I won't tell anybody that your now drinking all hours of the day. Sorry, I didn’t see any piggy hair in this scrapple. I think Habbersett leaves that and the oink out of their scrapple. I’ll give a better explanation of Milk Stouts in upcoming posts. I think you’ll like them. I just had to post this one from today’s breakfast, thought you would like it. Sorry I’m still in denial, I don’t have a drinking problem the rest of society does. My quest it to prove to society that there is a beer for everyone and a beer for every meal no matter what time of day you eat. I’m just rediscovering what the monks have known for centuries. Missy just attempted to chastise me for pouring a Leinekugle Oktoberfest. It's about 6:51 and I just got home after a twelve-hour shift at work. So it's 6:51 AM -- couldn't I get some ham and eggs with my beer? Hey after a 12 hour shift you’re entitled to a beer, AM or PM!